This is the genuine and original Master Blend that others have attempted to copy. Make sure you buy Chill/Lucid Blend from only registered dealers of SweetSmoke Herbs, or your product will be a cheap imitation, without the quality and strength of the real Chill/Lucid Blend. See the "Does Chill/Lucid Contain Nicotine" article for more on the manufacturer's website. Smoking or inhaling the aromatic vapors produced by burning incense is a millennia-old practice. Inhaling the smoke from burning aromatic herbs is possibly as old as the capacity to control fire. This herbal smoking blend contains a strong mixture of herbs, oils, extracts and resins. This Top Selling product comes packaged in a vinyl tobacco pouch complete with rolling papers, and is a fraction of the price of any competing herbal product of its kind. Enjoy this and its sister product, Daganda, also in eye-catching packaging, complete with hemp rolling papers. We are so confident in this product that even if it's opened, we offer our 100% Satisfaction Guarantee within 7 days of the delivery of your order. 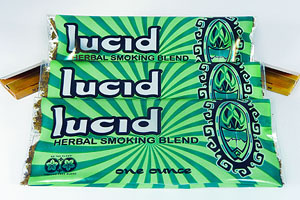 Known as Chill Blend, Lucid Blend, and Chill /Lucid Herbal Smoking Blend, we carry the original and only genuine product. Mixes well with any of our 50x resin packs to give it extra potency and flavor. IMPORTANT: Why the name change? - There were too many copycats and too many lawsuits trying to protect Chill Blend's name and reputation, so it's been re-formulated into an even more adventurous blend, with new vaporlock packaging that will keep your Chill/Lucid Blend as fresh as the day you purchased it for up to a year. Ingredients include a secret blend of herbs, oils, and resins, including Mugwort, Catmint, Woodruff, Betony, Blue Lotus, Blue Lily, Calamus, Galangal, Saffron, Neel Leaves, Brahmi, Indian Sarsapilla, with aromatics of Frankincense, Myrrh, Catnip, Passion Flower, and Licorice. Also blended with a dash of aromatics of Sage, Clove, Cinnamon, Wormwood, and Blue Lotus.